This circuit uses a switch to starts. When the switch is open, there is no current flows. The current will flows from the cathode to anode when the switch is closed. The current continues to flow, although the switch is now opened. There are two methods to stop this current flow. First method is remove the anode/cathode voltage. Another method is reverse the polarity of anode/cathode voltage. If the thyristor is used with an ac supply, it will conduct only on positive half cycles and when negative cycles, the thyristor is switched off automatically. 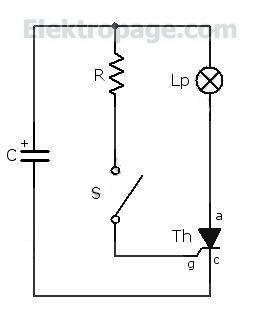 The gate current is limited by the series connection between gate and resistor.